Our film processing and printing are done to the highest industry standards, using the best practices established by the photo industry. We follow manufacturer’s guidelines from Eastman Kodak, Ilford, Fuji, Agfa; we occasionally will deviate from their recommendations when experience shows them to be “off.” In many cases, we’ve helped manufacturers make corrections and improvements to their products. Our prints are in galleries, portfolios, and collections worldwide. Film that we’ve processed has been published in a wide variety of publications, from fine art books to Sports Illustrated. We’ll work with you to achieve the results you want. Some of the unique things we've done are colorization of black-and-white photographs, retouching and distortions, contrast masking, and focus modification. Talk to us about what you're trying to achieve and we'll offer our best suggestions and ideas. Many professionals have us print their portfolios – we maintain their negatives on file and make new prints on request. This is a great option if you're a busy photographer and need prints on a regular basis. We also consult with photographers and photo lab owners. 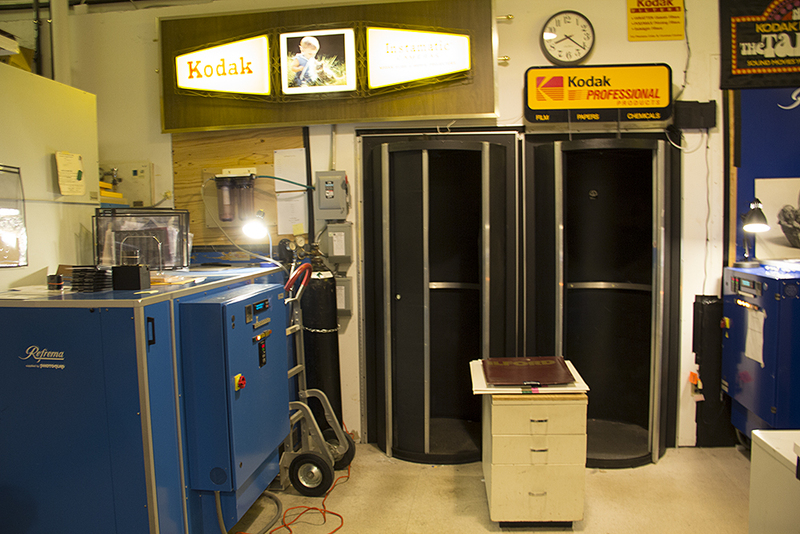 If you are considering building or expanding a professional darkroom, we’ll be happy to help. Please contact us. $D-76, HC-110, T-Max, or Xtol Developers -- Your Choice! Push/Pull -- Up to 2 Stops add 50%; Over 2 Stops add 100%. Allow 48 hours for process and contact. We specialize in making enlarged contact sheets for easier evaluation. Your clients will love these giant contacts! No Spinning or Oil to Potentially Ruin Your Originals! All scans are 16-bit RGB files saved as .TIF files using the Adobe RGB Color Profile. Our best attempt is made to match the original transparency. In the case of negative materials, we attempt to find a neutral area as a basis for color correction. Your files are kept on our hard drive for ten days as a professional courtesy. Your entire roll of film scanned with each image being 3 MB, 7MB, or approximately 15 MB in size. Each image will be saved as a JPEG. We have a large selection of Imacon film holders for scanning all popular sized film formats up to 5x7. If you have an odd-sized format please contact us to discuss options, as Imacon holders may have to be custom made to accommodate your format. Normal turnaround is 48 hours. As a courtesy, we hold your files on our hard drive for ten days after delivery of your order. Using our media, we will archive your image for $5.00 for a period of 90-days. Please indicate desired cropping if you only want us to scan a portion of your original. Ganging individual pieces of film is not possible. Confused about ordering scans based on file size instead of resolution or percentages? Simply open a new file in Adobe Photoshop and use the “Image Size” command to determine the equivalent file size (in megabytes) for your application. Or contact us for more help. Note that 16-bit scans are twice the file size of 8-bit scans. If you normally print an 8" x 10" @ 300 dpi, 20.6 mb RGB 8-bit file, the scan you need is at least a 41.2 mb (plus extra from cropping) as a 16-bit file. Don’t miss our comparison between our Imacon 848 and an Epson 3200 flatbed.